Close up of image 'lnwrmg2819' looking towards New Street showing Marston Green station from the Coventry side of the level crossing. 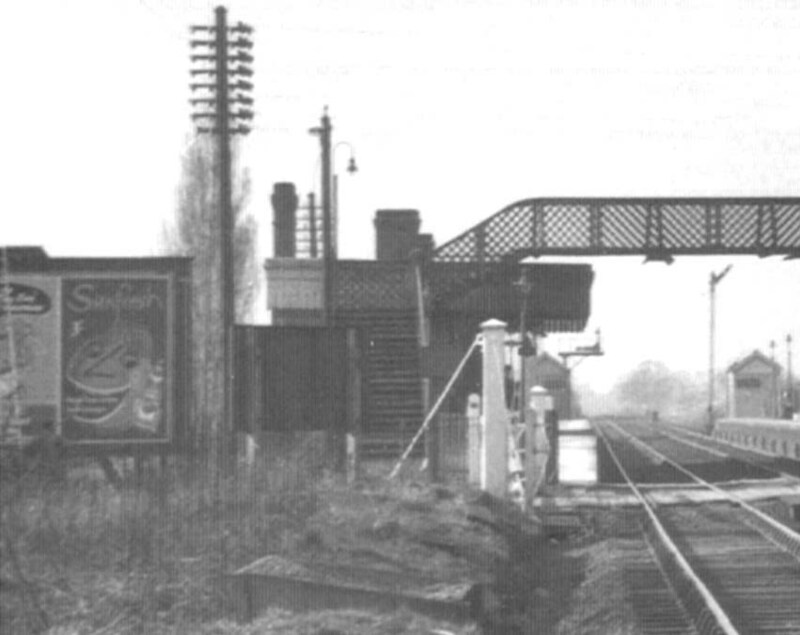 The lower profile of the ex-LNWR passenger footbridge is clearly seen and explains why the centre section spanning the tracks needed to be replaced when the route was electrified. At the far end of the two platforms are two timber huts which are shown on the plan seen in image 'lnwrmg2816a' with the code 'Lat'. Following a debate as to what was their purpose - suggestions varied from being allied to safety precautions relating to Elmdon Aerodrome (now Birmingham International) which lay to the left and whose principal runway finished just short of the line, to being gentlemen's toilets. Harry Jack, and Reg Instone of the LNWR Society, came to the conclusion that they were indeed lavatories. As Reg Instone said, slightly peculiar location, but there it is! The safety precautions put in place by the LMS at Marston Green due to the proximity of the aerodrome included emergency colour signals being installed a little further down the line. These were normally not illuminated but in the event of the down line being obstructed or damaged by aircraft, the lights could be set to danger by the signalman. When lit the lights displayed both yellow and red aspects, and should a train be stopped by the emergency signal, the driver could not proceed until the light had been extinguished and permission given by telephone.